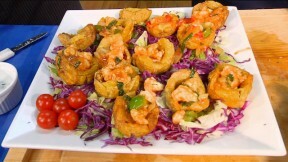 Tostones are fried plantains pounded flat and then fried again to create a delicious chip. They are a staple in most Latin American cuisine and throughout the Caribbean. Totstones can be eaten alone as a snack or used as the base for another dish. In Tostones Rellenos de Camarones, these fried tostones serve as the perfect complement to a filling of shrimp cooked in a tasty red sauce. Prepare Shrimp: In a large skillet heat the olive oil. Add the onion, fresh garlic, green pepper, and cilantro, and sauté in the olive oil until the veggies are limp. Add the wine, tomato sauce, oregano, garlic powder, salt, black pepper and cayenne pepper. Sauté all very well, for about five minutes. Lower the heat and add the cleaned and cut up shrimp. Let it cook until the shrimp turn pink. Do not raise the flame. Turn off the heat and remove from the burner. Leave it covered until ready to use. Prepare Plantain Cups: Peel the plantains, cut them into 2-inch barrels, and fry them in oil of choice at 325 degrees for about 7 minutes, or until golden and soft inside. One plantain should make 4 cups. Use a “tostonera,” or plantain press, to mash them down. Fry the cups a second time at 365 degrees to get a crispy shell, careful not to let them turn too brown, and stuff them with the shrimp.